The groin, or inguinal region, is the area between the abdomen and the thigh on either side of the pubic bone. Groin lumps can be caused by a variety of conditions from less emergent to more emergent described in further detail below. Before seeking care for a groin lump, it may be helpful to take note of some of the following characteristics as your medical provider will likely evaluate for them. There are various specific structures within the groin region muscles, nerves, arteries, and ligaments. Muscles: The muscles of the groin are the adductor muscles. These muscles allow you to bring your thighs together and work with other muscles in movements such as bringing the knees to the chest. Furthermore, the muscles of the abdomen also connect in this area. Nerves: The nerve that provides sensation and innervation to the groin area is the obturator nerve. Other nerves such as the femoral and lateral cutaneous also pass through this area but do not give direct sensation to the groin. Lymphatics: Underneath the skin, there are three to five lymph nodes structures throughout the body that play an important role in allowing the body to fight off infections. Inguinal ligament: The inguinal ligament is a band of fibrous tissues that help protect and support the other tissues of the lower extremities. The inguinal ligament forms the bottom of the inguinal canal (a triangle-shaped opening in the groin where the spermatic cord (the cord that holds up the testicles) passes from the abdomen to the scrotum in men. A hernia occurs when part of an organ pushes through an opening or weakness in the muscles /tissues that surround it. The protruding organ can result in a noticeable lump or bulge in the area. Hernias in the groin are called inguinal hernias, and there are two types that can form [3,4]. Direct: This type of inguinal hernia occurs when the abdominal muscles become weak. A portion of the intestine can push through this weakened wall and form a lump in the groin. Indirect: This type of inguinal hernia occurs due to a defect during infant development. In boys, a structure called the inguinal ring allows the testicles to drop into the scrotum during development but closes after the process completes. When the ring does not close properly, a part of the intestine can push through creating a lump in the groin. 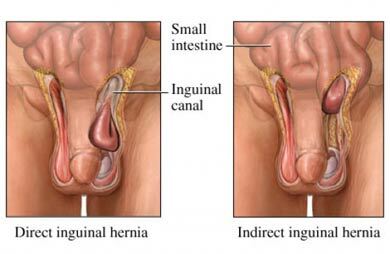 See this image here for a visual representation of the structural differences between a direct and indirect hernia. Other causes of groin lumps may include the following. Lymphatic: The lymph nodes are structures that contain immune cells that fight infection and filter harmful substances from the body. When these structures become infected, they can swell and result in palpable lumps. The groin contains many lymph nodes that are susceptible to infection and swelling. If swollen lymph nodes are causing the lump in your groin, you may also experience tenderness and fever as well. Cancerous: Testicular or penile cancers may also present as swollen lymph nodes in the groin, so it is very important to follow-up with your physician if you notice a lump in that area accompanied by symptoms such as pain, weight loss or dull aches in the lower abdomen. Dermatologic: The groin (similar to the armpit, buttocks and under the breasts) is an area that naturally contains hair follicles surrounded by many oil and sweat glands. The chronic, long-term skin condition hidradenitis suppurativa can develop in such areas and result in multiple, painful and inflamed lumps under the skin. Moreover, the groin is an area often covered by clothing, which can further exacerbate this inflammatory dermatologic condition. The list below shows results from the use of our quiz by Buoy users who experienced groin lump. This list does not constitute medical advice and may not accurately represent what you have. Surgery: If an inguinal hernia is causing your groin lump, your physician may suggest open or non-invasive surgery to relieve discomfort and prevent complications. However, if your hernia is not causing you significant pain or discomfort, your physician may suggest watchful waiting. Anti-inflammatory: Hidradenitis suppurativa can be treated with various types of medications that target and decrease inflammation, including immune system suppressing drugs. Cancer treatment: If your groin lump and associated symptoms are due to cancer, your physician will discuss treatment options including surgery, radiation or chemotherapy. These could be signs of an incarcerated hernia . A hernia is incarcerated when it becomes trapped in the abdominal wall. Incarcerated hernias are dangerous because they can wrap around themselves and cut off blood flow to the trapped tissue. When this occurs, a strangulated hernia results, which can have life-threatening consequences if not treated promptly.